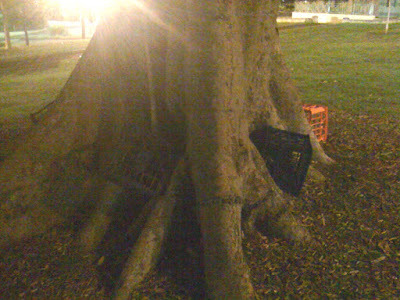 Four milk crates are wedged in the ridges of this tree trunk at Green Park on Burton St, Darlinghurst. A) Too intellectual. They have regular meetings “under the old oak tree” to discuss the dialogues of Plato. B) A crashing market caused by homeless bros chatting on milk crates because it's more “upwardly mobile” than getting high. 7 words: GIANT TITTEH EFFIGY BUILT FROM MILK CRATES!!! !